The real estate industry is on the brink of change. iBuyers are shaking up the market. Instant access to homes is becoming a consumer demand. Voice search will replace keyword search. Blockchain has the potential to revolutionize the real estate transaction (imaging buying a home in days, minutes, seconds!). And data might as well be the Philosopher’s Stone. So how do real estate professionals keep up with the quickly changing landscape? Every year, nearly 8,000 real estate professionals invest their time and money to attend Inman Connect. They come to stay on top of a volatile market, grow their businesses and to stay at the forefront of the industry. The theme for Inman Connect next month is Better, Faster, Together and a major benefit to attending is discovering new technology to grow your business and become better, faster and more connected— and next month’s event in San Francisco will have that in spades. @properties, a leading independent real estate brokerage firm in Illinois, believes that technology is the key to staying ahead of its competitors. Examples like this are endless, but with speakers like Matthew Luhn, Bob Hoffman and Shabnam Mogharabi, it can be hard to carve out time to visit the partner showcase and experience the technology firsthand. To help, we created the Meeting Planner tool. 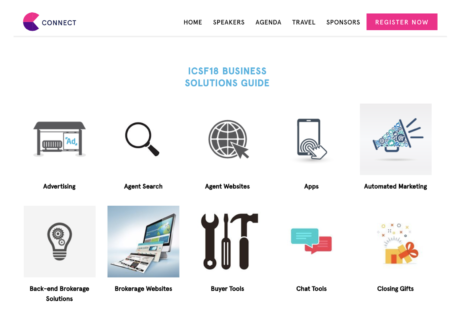 With one click, you can request a time to meet the vendors you want to meet, and demo the products and solutions that can help you grow, compete and serve your clients better. Right now you might not be sure exactly who you want to meet, but you know what goals you have, and what kind of tools you might need. That’s why we sorted all our sponsors into a Business Solutions Guide. It’s a directory you can use to find the sponsors in that category. If you know you want to talk to someone about a CRM, about chat, or about syndication, we make it easy. Inman Connect is about growth — and we’re here to connect you to the products and services that are best suited to help you do just that.